Many families recycle bottles, cans and paper products in the kitchen but it’s harder to do throughout the rest of the house. One place we use a lot of plastic bottles is in the bathroom and they tend to end up in the trashcan along with other things that can be reused, like toilet paper rolls. Turns out we aren’t alone. 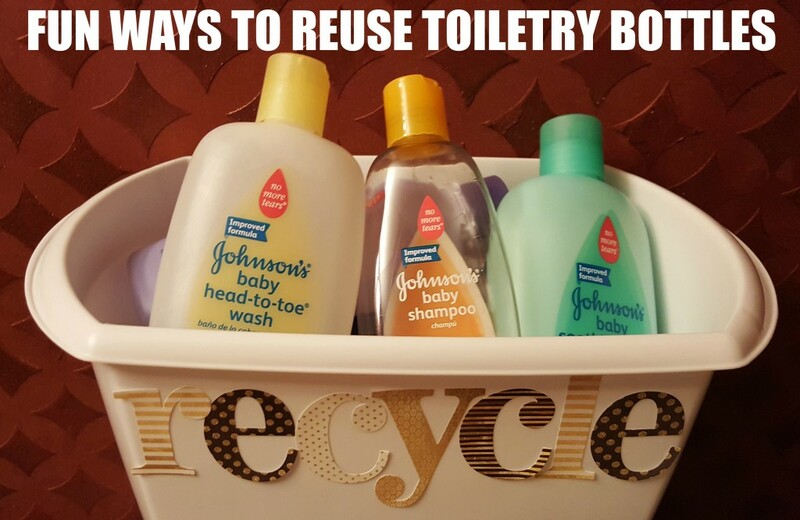 A 2016 consumer survey on in-home recycling habits, conducted in partnership with Johnson & Johnson Consumer Inc., shows that one-third of regular recyclers admit that it never even occurred to them to recycle in the bathroom and only one in five recyclers have a recycling bin in their bathroom. I wanted to make bathroom recycling much easier for our family so I decorated a small trash can for the boy’s bathroom that we could put all the empty bottles and other items in until we needed them for other things around the house. I explained to my boys the importance of recycling and shared with them what types of things we could recycle in the bathroom which is everything from shampoo and mouthwash bottles to soap and bandage boxes. To make the recycling can I used a 3 gallon garbage can and attached stickers that said “recycle”. (Note: I suggest putting a layer of mod-podge over the stickers to handle the moisture.) You could also have the kids write and color on the can. I was going to do this but the boys bathroom is also the bathroom that guests use so I decided against it because I wanted the recycling bin to blend in with the bathroom decor. For extra fun, when a bottle is close to being empty I add some washable kid’s paint in it and I mix it up. Then I let the kids paint a clear art mat in the bathtub. It’s easy to clean up because it’s mixed with the soap and it’s already in the tub so the mess is contained. If the bin gets too full we can always recycle the items in it but our family tends to reuse things as many times as possible. I think it’s the preschool teacher in me that wants to find new ways to use everything before I get rid of it (see my recent post on 100 kids crafts that reuse household materials for proof). Want to learn more about recycling personal care products used in your bathroom? Check out the Johnson & Johnson Consumer Inc. Care To Recycle® website. Care To Recycle®, a program of Johnson & Johnson Consumer Inc., provides creative new ways for parents to reimagine their recycling habits beyond the kitchen and into the bathroom, while engaging their children. The Care To Recycle® program aims to raise awareness of the importance of recycling personal care products in the bathroom, including preventing valuable materials from entering landfills unnecessarily. Together, we can help create a healthy planet for our kids today, and for future generations. What ideas do you have for recycling products in the bathroom?